Abstract: Our Acer 512T has been going all over North America lately (read: in planes, trains and automobiles), we've had enough time on it to finally write up a review straight from road experience. For portable computers nothing is more important then battery life. The Acer fairs well here, having a Lithium Ion battery (weighs around 1 lbs) with a life of about 4 hours. I'd take off about 45 minutes if your spinning a CD the whole time, and a bit less then that if you have MP3's going constantly. There is a handy little icon on the toolbar which shows a rough estimation of battery life, expressed in percentages. Holding the cursor over the little battery icon, gives you the value. The computer is also nice enough to give an on-screen warning when 10% of battery power has been reached, and suggests you save your work right away. The battery is located at the front of the computer, accessable from the left side. Also on this side of the computer are the Power-On switch, the Infrared Port, and the cooling fan for the CPU (center). As with most portables these days, if the battery is running low, and the AC-adapter is on hand, it can be plugged in at any time - the computer automatically switches from battery usage to the wall power supply. Conversely, if plugged into the wall, and seeking a bit of mobility, unplug yourself and walk freely, the computer will automatically go to battery - which is hopefully nice and charged. ;-) The AC adapter is optimized for those traveling the world. It can handle wall voltages of 100-240V, 50-60Hz itself, and spits out 60W of power. The model we have is based upon Intel's Celeron 366Mhz. Now I know that if individual computers are using the same chip, they should have about the same performance, and general characteristics. That isn't quite the case with the mobile version of the Celeron - it seems to run faster then my PPGA equivalent. Programs load up very quickly (64MB under the hood), but changing between programs can be a bit slow at times, and sometimes HD access lags have an effect on overall usability. There are times when the computer just pauses with HD chirping away, freezing work for a few seconds. This doesn't happen very often at all, but when it does, it's somewhat annoying. 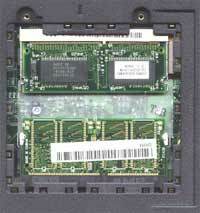 As with the modem, a small metal cover on the bottom of the computer is removed by screw to reveal the RAM slots - currently holding 64MB, but expandable to 256MB. This Acer has a PCMCIA 10/100 GVC NIC card in it. A laptop without a network card is severely limited in its use. Transferring info over the internet is limited to connection speeds and moving info over a 1.4 MB floppy is unrealistic. Enter in the NIC card. Connecting on the fly is easy - a small adapter cable comes with the PCMCIA card and converts the Series II socket to RJ-45 (Ethernet Cat-5 Cable). I found it entirely indispensable to the point I carried around a small 10/100 NIC card and length of crossover Ethernet cable incase my hosts' computer was without one. There were no problems connecting up to another computer - simply plug in adapter, plug in Ethernet cable and check out the network. As long as sharing is enabled that is. Transfer of files was quick and easy to my hosts' computer, greatly increasing the usability of the Acer with little affect on the computer while transferring files. Series II to RJ-45 adapter cable. With all the components crammed into the laptop, and the dense materials that make up today's batteries, weight is a major issue. The Acer 512T weighs in at 7.3 lbs.. not an amazingly light machine, but not a chunk of lead either. To be fair, I lugged around the computer for a day (minus 20 degree weather with no ill affects either) in a shoulder bag by itself and it wasn't a problem at all. On this trip I lugged it around in the same bag (which was full of a bunch of stuff I needed) and my shoulder was a bit sore by the end of the day. Hmm, actually I lost feeling in my left arm... That wasn't the computers fault, but then when would you go on a trip with *only* the computer in a bag - more likely plane tickets, notebooks, cell phone, and maybe a magazine or two would accompany the computer. With all the stuff I needed to carry along, the total weight was around 15 pounds. The overall dimensions of the 512T are: W12.1" x D10.1" x H1.8"
To summarize, the Acer 512T has a few minor areas which could be touched up to deliver a superior product, but even considering those few bugs I would still recommend it as an excellent laptop for anyone who travels. That it still works after everything I've recently put it through is a testament to its durability. The key features I particularly like are the built-in CD player, and on-board 56K modem and all around well design. Hopefully my real-life on the road experience with this computer will give a fair idea of its quirks and in general what to expect of it. Should anyone be considering this as their portable computer solution I would recommend it with a rating of 8.7 out of 10.